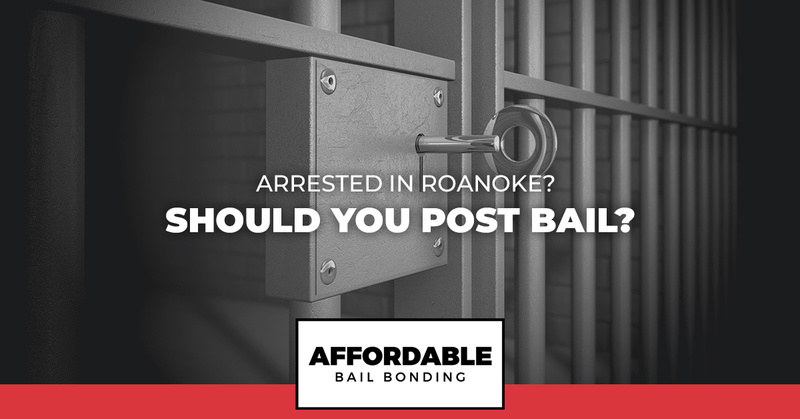 Affordable Bail Bonds Roanoke: Should You Post Bail After Being Arrested? Arrested In Roanoke? Should You Post Bail? While you may have never really thought about why you would need to know the ins and outs of bail bonds, we would disagree. Even citizens who strive to abide by the law may have to post bail for a family member or friend who has been arrested. The issue is, these are often the people who have no idea at all how to proceed when they get a call that informs them that someone they love is behind bars. In this post, we will discuss precisely what bail is and how you can weigh your options if you should find yourself responsible for getting someone released from jail. Additionally, we will give you a better idea of what other options the person who has been locked up has if you choose to not post bail for them. The entire reason bail exists is to ensure that a person will show up for their court date should they be released from jail in the interim. For the most part, people who have strong ties to the community in which they live will be released without having to post bail, also known as being “released on their own recognizance”. However, defendants who are considered to be dangerous to their community, on the other hand, may not be offered bail at all. If you do not fall into either of these categories, you will have to put up cash or another form of payment if you want to be released. In the case that a defendant is released from jail on bail, but they do not show up for their court date, an arrest warrant will then be issued and the bail will be forfeited entirely. The good news is, you have options. If you want to get out of jail, you can choose to either pay the amount outright and walk out of the jail. More commonly, however, people will use a bail bondsman to help them come up with the money that is needed to get you out of from behind bars. You can learn more about them below. While there is a certain amount of money that your bail is set at, the court may be willing to accept only a certain percentage be paid up front (usually 25-30 percent). Once the person arrives to the court dates, this money will then be refunded to the defendant. This is obviously not the ideal option. No one wants to sit in a jail cell for any amount of time, let alone for days or even weeks leading up to their court date. People who do not have access to money right away can always hire a professional bail bondsman to make bail. While payments to bail bondsmen are non-refundable, they tend to only be about 10 percent of the total cost of bail. If you need to help someone you love get out of jail, call the professionals at Affordable Bail Bonding in Roanoke. Contact us now to learn more! Learn More About Our Bail Bond Services Here!